Shelton, CT, June 2016 – Centrix, Inc., a leading innovator of dental materials, preventive products and applicators and delivery systems, today introduces NoCord™ VPS, the first one-step, self-retracting impressioning system that retracts gingiva, controls bleeding and delivers an accurate, final impression all in one system! According to Frank J. Milnar DDS, AAACD, "NoCord VPS is a trifecta for impression materials; sulcus expansion, hemostasis and accuracy. NoCord is the next generation of impression materials. There are less steps and cost because the impression material does more." NoCord™ Wash is the first wash material that incorporates a hemostatic agent to control bleeding and fluid flows. 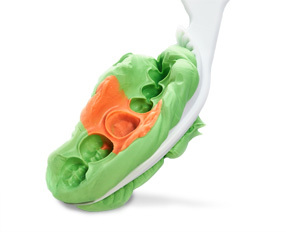 The unique NoCord™ MegaBody™ Tray Material is designed to work with NoCord Wash, driving the wash to gently retract gingiva from the tooth. "For patients, retraction of the gingiva is uncomfortable and often painful. Placement of cord is time-consuming and can even exacerbate tissue and bleeding problems. That's why we developed NoCord VPS – it eliminates the part of impression making that dentists and patients don't like – retraction and hemostasis steps," said Dr. William Dragan, founder of Centrix. "With NoCord VPS, a dentist uses their normal technique, except they now can skip separate retraction and hemostasis steps." NoCord VPS is very competitively priced and is available in introductory and refill packages. It has been in clinical trials for over two years and with very strong results. "Through 30 years of clinical practice, having tried and used every impression material and gingival retraction method that has been available, I have found the NoCord VPS impression material to be the easiest method of saving time when taking impressions," said Gregori M. Kurtzman, DDS, MAGD, FPFA, FACD, FADI, DICOI, DADIA. To learn more about NoCord VPS, please visit CentrixNoCordVPS.com! Centrix is a leading innovator of dental materials, preventive products and applicators and delivery systems. Along with the Centrix C-R and Mark III syringe guns, we provide the most comprehensive line of syringe delivery systems. We pioneered the first one-piece disposable dental applicator brushes: Benda® Brush and Benda Micro flocked applicators. Realizing the importance of asepsis in the dental office, we developed the LolliPack® single-use package, which is now the standard application method for fluoride varnishes and other unit dose materials. FluoroDose® Fluoride Varnish has been recognized as the best Fluoride Varnish for the last several years. Centrix also offers the most complete line of Temporization Materials: Tempit® for filling, Access® Crown for temporary crown and bridge, and NoMIX® temporary cement. And Centrix is forging new paths in Impressioning with NoCord™ VPS, the first one-step, self-retracting impression material and the Centrix Couture™ line of esthetic finishing and polishing products. Centrix products are available from all leading dental distributors or by calling Centrix at 800.235.5862.